HP Inc. really wants to help retailers Engage their customers. On Wednesday the company unveiled the latest devices and service offerings for its Engage line of retail solutions: Engage Go Convertible, which allows retailers to support customers on both stationary and mobile devices; Engage Go Mobile, which allows retailers to solely adopt Convertible’s mobile component; the Engage Flex Pro, a secure, mobile, modular system platform aimed at retail and hospitality business managers; and the Flex Pro-C, which delivers an experience similar to the Flex Pro but on a device that is 30 per cent smaller. 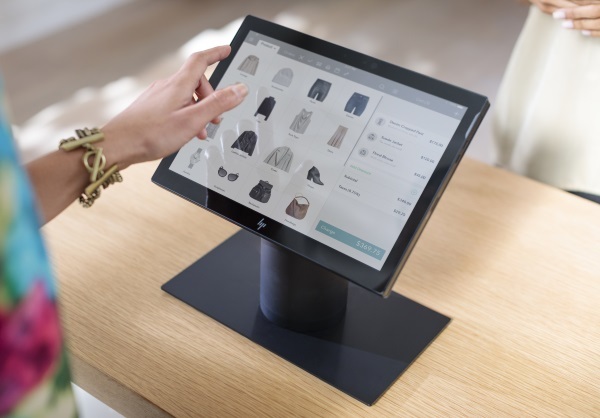 In an Aug. 1 statement, HP retail solutions manager Aaron Weiss said the new offerings were designed to help retailers meet the multi-platform demands of their increasingly tech-savvy customers. The platform’s mobile point-of-sale (POS) unit can be used to check inventory, register customers, and close sales wherever customers happen to be. Data protection that uses a self-healing PC BIOS to guard customer and business information, an HP Smart Dock tablet lock to help prevent the device from being stolen, and two-factor authentication with optional fingerprint and/or NFC readers. A seventh-generation Intel Core processor and Windows 10 OS. The Engage Go Convertible, courtesy HP. Both the Engage Go Convertible and Engage Go Mobile systems, the latter of which comes without a dock, deliver the same design, security, and durability, according to HP. The devices also feature HP’s Fast Charge technology – that is, they can reach a 50 per cent charge in 30 minutes – and boast up to 13 hours of battery life, according to HP. A flexible system that allows retailers to customize their point of sale, video surveillance, processing/controlling, or digital signage operations with flexible connectivity, graphics, networking, and accessory options. An eighth-generation Intel Core processor, Intel Optane memory, Windows 10 OS, and additional ports for add-ons such as SSDs. HP Engage Flex Pro and HP Engage Flex Pro-C are expected to be available this month, while HP Engage Go Convertible and HP Engage Go Mobile are expected to be available in September. Prices were not released. You can find more information on these solutions here.